NEW YORK - March 22, 2019 - Bandsintown, the most trusted source for concert discovery, today announced the acquisition of Hypebot.com and MusicThinkTank.com, leading artists centric and technology news outlets founded in 2004 by music industry veteran Bruce Houghton. The acquisition expands upon Bandsintown’s mission to help musicians grow their careers by offering free tools to over 500,000 registered artists while simultaneously providing a platform for fans and artists to connect. "Hypebot was created as a guide to understanding the new music industry - not just labels and tech companies; but more importantly, the artists and music that give it life,” said Hypebot founder and editor Bruce Houghton. 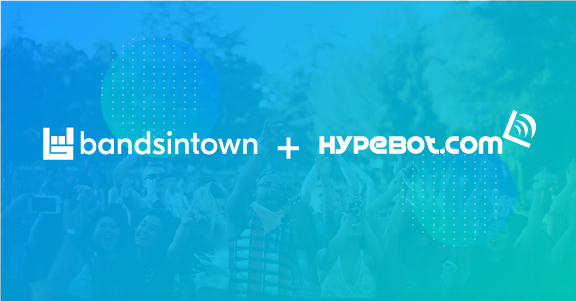 "Working with a successful artist-centric team like Bandsintown will give Hypebot the resources to expand on our mutual mission of empowering artists. I look forward to contributing to Bandsintown's ongoing effort to help more artists and managers build a successful and sustainable career in music, with live music at its center." Bruce Houghton is Publisher and Editor of Hypebot.com and MusicThinkTank.com, covering the new music industry and how technology is changing the way that music is made, promoted and monetized. He is also the founder and president of Skyline Artists, a nation booking agency representing a diverse roster including Zoe Keating, Poco, Roger McGuinn and Darlingside, Freddie McGregor, The Motels and many others. A sought-after music industry expert and speaker, Houghton has served on the Advisory Boards of SXSW Accelerator, MidemNet and The New Music Seminar. He has appeared or had his writings featured on NPR, CNN, The Financial Times, Billboard, Forbes, Pollstar and more.